The Australian Government, through the Department of Social Services, supported the 2018 AFL All Abilities National Inclusion Carnival from June 18-23, as part of the promotion of the 2018 International Day of People with Disability program. 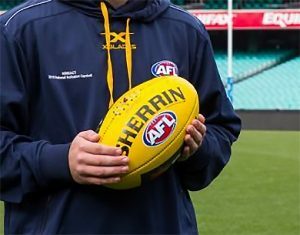 The AFL National Inclusion Carnival is an annual event which provides some of Australia’s most talented footballers with an intellectual disability the opportunity to represent their state or territory on the national stage and to showcase the significant abilities of footballers with an intellectual disability to the broader community. This year the Carnival was held in Launceston, Tasmania, across four venues over the course of the week. A Welcome video message was provided by the CEO, Gill McLachlan, and the event was attended by the AFL Commissioner, Simone Wilkie AO. Supporting the Carnival provided the opportunity to increase inclusiveness by raising awareness of the achievements, contributions and abilities of people with disability and encouraging inclusive practices and attitudes. Throughout the week, players promoted the importance of people with an intellectual disability engaging in sport across Launceston. Data collected confirms the positive impact the Carnival has had on the footballers, beyond playing football. The biggest impact was providing a sense of belonging. “Thank you for this life changing experience” – player “Owning my disability is a big honour and I’m proud to be going for the second year” – player. Two of the families have thanked the team for giving their son the “best week of his life”.